NSC05_10° - "Whisker Type" probes for noncontact/semicontact modes with inclination angle 10 degrees. 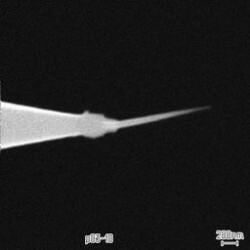 Free calibrated SEM photo for each "Whisker Type" tip to let you know the real shape of the tip. Fig. b: SEM image of four "Whisker" tips grown on the silicon tip in accordance with preset sketch. Chip has one straight spring. NSC05_10° - for noncontact mode.